Hello, my name is Jon, I am an enthusiast and a home scholar, maybe not a so bad alternative considering how boring and useless school can be in Kosovo. My tools are khanacademy.org, YouTube, instructables.com, eBay (yes, you can learn while shopping! ), etc. With a 3D printer you can print all the plastic parts of another 3D printer. But more than that, you can build other useful stuff or even invent some! A site on which people “upload” and “download” things is thingiverse.com. One is a wind turbine from used plastic bottles! How awesome is that, turn junk into renewable energy! So having a 3D printer is a neat thing, so I asked IPKO Foundation in conjunction with their Sponsorship Program for funds, where I also explained about all the stuff I could make with a 3D printer, starting with chocolate heads to a personal CNC. My laboratory is far from being complete, but IPKO Foundation helped me on reaching my first milestone, the 3D printer. I am investing the money I earn from the 3D printer to further grow and widen my area. I’m also working as a freelancer as a 3D modeler for 3D printing. 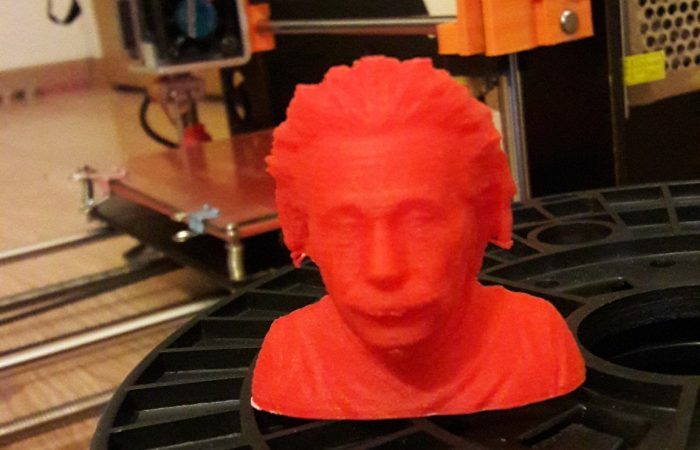 Einstein is one of the figures I 3D printed. Of course it is not the only thing. I repaired mom’s kitchen mixer, made an organizer for pens and improved some parts of the 3D Printer. There is plenty of material in YouTube on how to build a 3D printer from scratch. If you got the time and nerve go ahead. Otherwise you’d be just fine by ordering a pre assembled Ultimaker, although a bit expensive. Or you may also join a local maker/hacker space. I encourage you to visit IPKO Foundation and tell them about what makes you passionate. May it be painting, music, dancing, sport, traveling, making. I am sure that they would share the passion with you and help grow something amazing!